The Spanish flu of 1918 was the first pandemic to occur in the era of “mass society,” when public access to transportation, education, and amusement vastly increased the ability of communicable diseases to spread. When the flu hit the University of Oregon, members of the campus community drew together to care for those who were ill, with the president’s wife personally watching over many students. 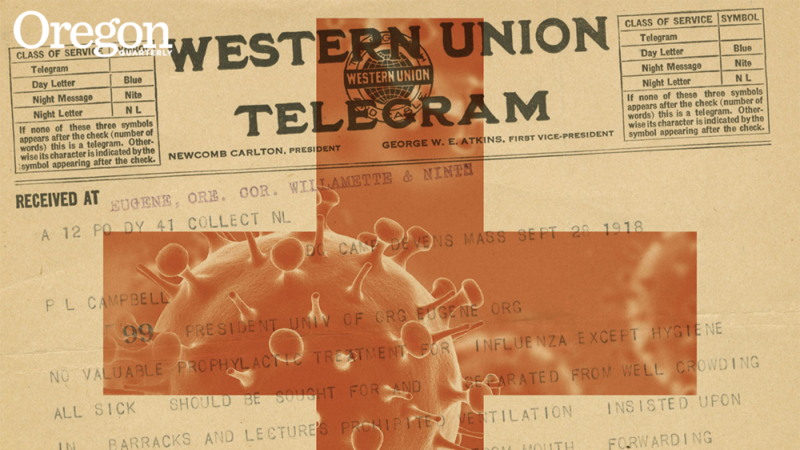 In 1918, University of Oregon president Prince Lucien Campbell faced a challenge no UO president had faced before: guiding the university through a mysterious, deadly plague. Day by day that fall, he watched students and faculty sicken and die from the Spanish flu, a pandemic that killed an estimated 50 million people worldwide. But by proactively using the tools of organization, communication, and caring, Campbell prevented potential devastation of the campus community. The 1918 Spanish flu epidemic is “America’s forgotten pandemic,” writes New York Times science reporter Gina Kolata in her book Flu: The Story of the Great Influenza Pandemic of 1918. “Nothing else—no infection, no war, no famine—has ever killed so many in as short a period.” The United States entered World War I on April 6, 1917. 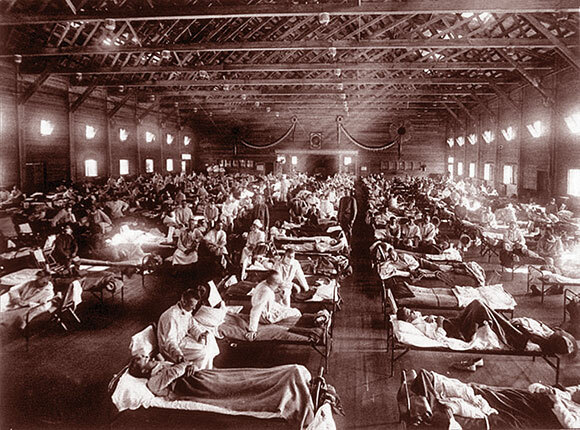 Eleven months later the deadly influenza first appeared in this country at Fort Riley, Kansas. Thousands of soldiers there got sick, and 38 died. Then, “as summer arrived, the flu seemed to vanish without a trace. But a few months later [it] was back with a vengeance.” It reappeared among troops in Boston on August 28, and within days was roaring across the country. No one knows where the epidemic started, but it hit Spain particularly hard, sickening King Alfonso XIII, so the world press nicknamed it the “Spanish flu.” Normally, influenzas kill one percent of the people they sicken, but this influenza killed 2.5 percent. Most of the people who died were healthy young men. “Every other influenza, before and since, has killed the very old and the very young, sparing healthy adults in the prime of life, but nearly half of the influenza deaths in the 1919 pandemic were young adults 20–40 years of age,” writes Kolata. The respiratory illness was spread by coughs, sneezes, and personal contact, and it decimated World War I military personnel, who were crowded together on troop ships and in barracks. And so the UO’s 1,375 students, many living in student housing, were at high risk. To compound the threat, the UO did not have an infirmary. Entering his 16th year as UO president, Campbell, like the rest of the country, was reading newspapers, watching the deadly, mysterious, and uncontrollable plague surge across the nation. Campbell acted proactively. For years he had been lobbying, unsuccessfully, for money to build a student infirmary; now he began to organize temporary hospitals on campus. On October 5, the Oregon Daily Emerald announced that “beginning Monday, every student and every member of the faculty must report daily at sick call in case he is suffering from any illness, however slight it may appear. It was decided that every suspected case would be isolated for observation and treatment. Infirmaries for men and women respectively are now being put in shape and will be ready in a few days. 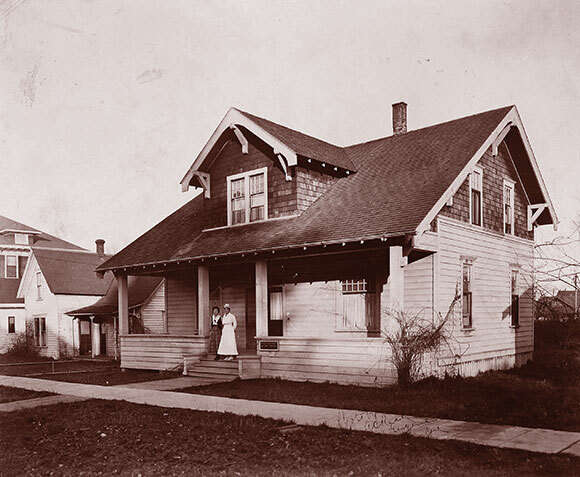 The women’s infirmary is in a nine-room house on University Street, just back of the women’s gymnasium, while the men will use the residence on Twelfth Avenue east formerly occupied by the Phi Gamma Delta fraternity.” Students who stayed in the infirmaries were charged $2 a day. 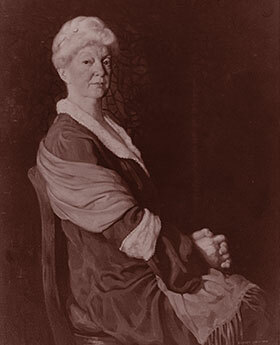 Campbell’s wife, Susan Campbell, helped organize the campus infirmaries. She had joined the university in 1905 as supervisor of student living, then resigned and married President Campbell in 1908. She worked ceaselessly throughout the crisis, visiting ill students and providing their parents with updates. The plague roared toward Oregon. “Influenza has spread to civilian population,” the Register reported on October 3. “Information coming to the public health service was that the disease was rapidly spreading among the civilian population of the country. The malady has appeared now in 43 states . . . it is epidemic in Virginia, South Carolina, and other places.” That day, Robert Claude Still ’14 died of influenza at Camp Colt, Pennsylvania. His brother, Lloyd, was attending the UO. The next day, the influenza struck Eugene, sickening several university students. On October 1, Congress appropriated $1 million to the US Public Health Service to “combat and suppress” the Spanish influenza. The health service sent posters advising the influenza was “As Dangerous as Poison Gas Shells.” UO students began making posters, too, and by October 10, bright orange fliers with flaring black headlines went up around campus, with directions on how to prevent the spread of the malady. That day, the Register printed an article by A. R. Sweetser, head of the UO’s botany department, called “How to Avoid the Influenza.” Sweetser advised people to avoid all spitting, to smother sneezes in handkerchiefs, and to “abandon the one finger method of cleaning the nostrils.” Eugene closed all theaters and churches and banned all dances, but the university and the public schools were still open. At Camp Arthur in Texas, Earl S. Powell ’18 died of influenza. 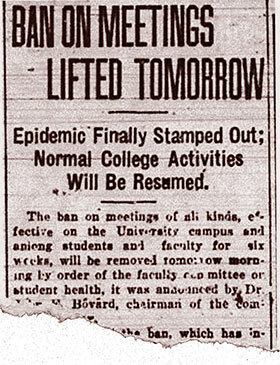 The next day the first two people in Eugene died of influenza and the city closed the public schools. The UO remained open. On October 10, former UO student Earl Cobb died at Camp Zachary Taylor in Kentucky, leaving behind his widow, Ada Kendall ’13, and their three-year-old son. By October 11, 237 UO students had influenza, as did economics professor Peter C. Crockatt. By October 12, the UO had set up four emergency infirmaries: two for women, located at 1191 University Avenue and at the Kincaid House at 14th Avenue and Alder Street; and two for men, at the Phi Gamma Delta and Phi Delta Theta fraternities. They were staffed by volunteers. “Mrs. P. L. Campbell has been working almost unceasingly in equipping the infirmaries,” the Emerald reported. The bright orange influenza posters blanketing campus were proving very popular. Army lieutenant Milton Stoddard ’17, stationed at Fort Stevens in Astoria, wrote to Onthank, asking for posters, saying he first saw and heard of the posters through an officer at Fort Stevens who received one from a University of Oregon student. By now, the plague had spread across the globe, killing millions of people, and on October 15, it killed Turner Neil ’18 in Nièvre, France. Campbell was wrong. On October 17, Thomas R. Townsend ’09, who had returned to the UO to attend officer’s training school, became the first UO student to die of influenza. The next day, two more students died on campus: J. H. Sargent and Richard Shisler. On October 19, the UO lost sophomore Glen V. Walter. On October 20, influenza killed former UO students Luke Allen Farley at Camp Pike, Arkansas; Kenneth Farley at Camp Lewis; and Richard Riddle Sleight ’14 in Portland. On October 21, freshman Emanuel Northup Jr. died at the Phi Gamma Delta infirmary, and former student William Allen Casey died at the officers’ training camp at Fortress Monroe in Virginia. Bovard announced on October 24 that faculty wives, led by Sally Allen, wife of School of Journalism dean Eric W. Allen, had made 10 dozen masks for university nurses and attendants. “Members of the SATC [Student Army Training Corps] here were ordered to wear gauze masks during the influenza epidemic if the situation seemed to warrant it, in a telegram received yesterday morning from SATC headquarters in San Francisco.” However, the US Army surgeon decided the situation did not warrant masks. “The epidemic is practically over as far as the Students’ Army Training Corps men are concerned,” said Colonel W. H. C. Bowen, SATC commanding officer at the UO. But on October 28, two more students died on campus: John Herbert Creech and Robert Gerald Stuart. Campbell was reeling under the strain. On October 29, he wrote, “We have been overwhelmed with the work required by the Influenza . . . it has been extremely difficult to think of anything except the serious cases which are in the hospital . . . there are two or three about whom we are very anxious.” The next day, student Sanford Sichel died on campus. Before the influenza outbreak in October, the Puget Sound Naval Shipyard in Bremerton, Washington, had sent six medics to the UO for an internship. Instead of studying, the Emerald reported, “they have given their full time to nursing influenza patients at the two men’s infirmaries on this campus. Walter Bauman, Paul Hamilton, and Arthur Ritter are stationed at the Phi Gamma Delta House infirmary, while Harold Connelly, Max Wilkins, and Boyd Haynes are giving their services at the old Phi Delta Theta house. They have been doing this work for the past three weeks and are attending no classes.” As lucky as the university was to have the sailors on campus, the sailors may have been even luckier. Influenza killed 77 seamen at Puget Sound Naval Shipyard; one of the first to die was Dr. Douglas H. Warner, UO Medical School ’18, on October 8. On November 9, the Register reported that in Eugene, “Epidemic is dying out. Only six new cases reported in three days.” Campbell left for a prearranged 11-day trip to Chicago, and was there on November 11, when World War I ended. Jubilant students thronged in the streets, ignoring university staff members imploring them to continue to observe the influenza ban on public gatherings. The students and Oregon celebrated twin joys: the end of the War to End All Wars, and the apparent end of the deadliest health crisis in US history. The epidemic had not ended, but was ebbing. The UO still banned gatherings. Then, on November 27, influenza killed Army lieutenant and UO art professor Roswell Dosch, a talented sculptor. Dosch was serving as a bayonet instructor at Reed College in Portland, working on a statuette, The New Earth, a memorial to commemorate the Oregon men who had died in the war, intended for the University of Oregon campus. Prince Lucien and Susan Campbell, who collected Dosch’s art, attended his funeral. On December 7, Bovard said he could not yet estimate the full financial cost of the epidemic, but that drugs alone cost approximately $600, nursing services cost between $600 and $700, and physicians’ bills totaled $35 a day. After Christmas break, the UO returned to normal. 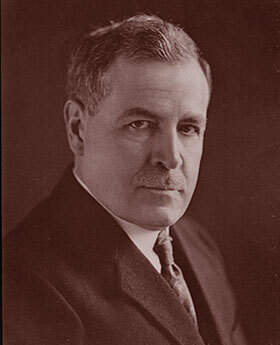 In 1919, a third, mild wave of the disease continued to sicken people: in early January, history professor R. C. Clark and five members of his family were hospitalized with influenza. By the spring of 1920, the deadly disease disappeared around the globe, as mysteriously as it had appeared. The US Department of Human Services estimates the disease killed 675,000 people in the United States, out of a population of 105 million, including 3,675 deaths in Oregon. A century later, headlines in Eugene are reporting eerily similar problems: globally, Ebola has killed thousands in Africa, and threatened to jump international borders; and on the UO campus, an infectious meningococcemia outbreak killed one student and sickened several others. The tools Campbell proactively used to guide the UO through the pandemic in 1918 are relevant today: organization, communication, and caring. Editor’s note: In 1936, the Student Health Service moved into a new building (now the Volcanology Building), which housed a 26-bed infirmary. In 1965, the current University Health Center opened, housing a 40-bed infirmary, isolation wing, and kitchen facility. By 1981, the need for infirmary beds had lessened and the in-patient unit was closed. The University Counseling and Testing Center now occupies the former infirmary space.